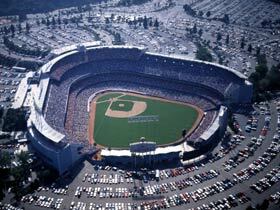 Walter O’Malley’s grand baseball ballpark — Dodger Stadium — opened on April 10, 1962. Where to Play in L.A.
One of the most powerful and successful businessmen of his era, or any other generation, Walter Francis O’Malley stamped an indelible mark on the global game of baseball. With his sharp leadership abilities and business acumen, combined with his love of life and keen sense of humor, O’Malley guided his Brooklyn and Los Angeles Dodgers baseball teams to international prominence. His life and career were extraordinary in many ways. O’Malley’s crowning achievements were the important westward expansion of Major League Baseball in 1958 and the building of Dodger Stadium in 1962, which was the first privately-financed ballpark since Yankee Stadium had opened in 1923. On December 3, 2007, O’Malley was elected to the National Baseball Hall of Fame by the Veterans Committee in its ballot of executives/pioneers. Induction ceremonies were held on July 27, 2008 in Cooperstown, New York. In December 1999, The Sporting News named O’Malley the 11th Most Powerful Person in Sports in the last century, while ABC Sports ranked O’Malley in its Top 10 Most Influential People “off the field” in sports history as voted by the Sports Century panel. But, his good old-fashioned American success story starts when baseball was king in the city where he was born. In a time when baseball had three New York-based ballclubs — the Yankees, the Giants and the Dodgers — at the height of their popularity, O’Malley understood the importance of creating a unique identity for his team. The Dodgers were hampered by a home stadium that was aging. 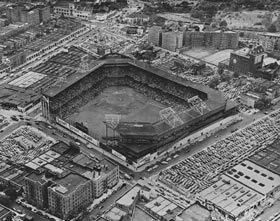 While Brooklyn’s residents indeed had a long-lasting love affair with “Dem Bums,” the nickname for their appealing Dodgers, the cozy ballpark called Ebbets Field was landlocked in a neighborhood which provided parking for only 700 automobiles. From the outset, O’Malley felt the Brooklyn faithful deserved a home field that was state-of-the-art, clean and proudly represented the city in which they lived. 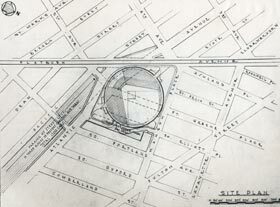 Ever the visionary, O’Malley had communicated with and later worked with famed architect R. Buckminster Fuller to design a geodesic domed stadium with a retractable roof in the early 1950s. 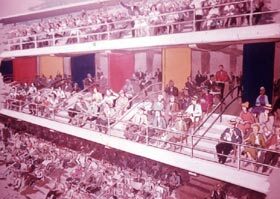 In O’Malley’s stadium, many new inventions would have captured the imagination of the public, among them a pole-less grandstand permitting an unobstructed view from every seat; a shopping center right on the stadium grounds; electronic ticket sellers which would let patrons choose their own seats from a giant tote board; and even “hanging boxes” to provide 1,500 luxury seats suitable for rental to season ticket holders. Had the support and enthusiasm for O’Malley’s vision been embraced by city leaders, the Dodgers would have remained in Brooklyn and history could have written a much different script. 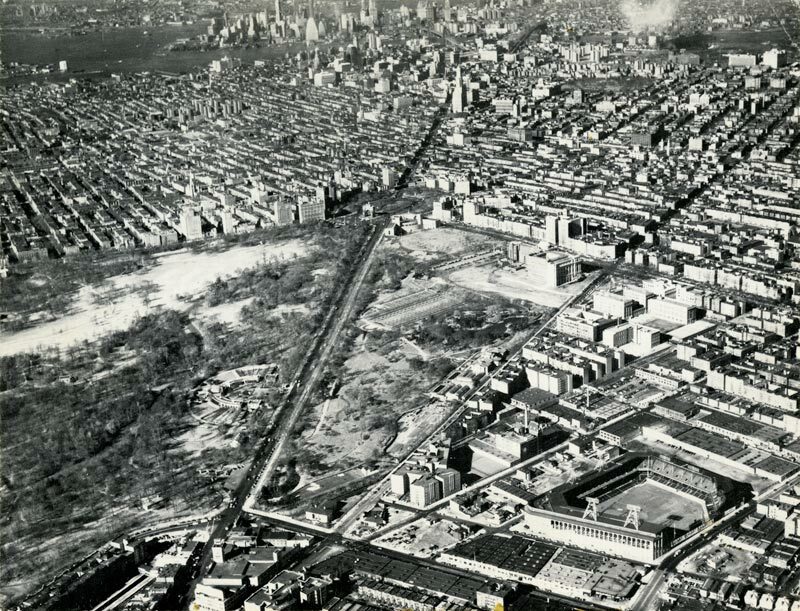 The property O’Malley pointed to in Brooklyn required the city to acquire the land through “eminent domain” and Moses refused to do this because he felt that private land should not be condemned for “public use” in this case, citing Title I of the Federal Housing Act. Moses disagreed with the idea of the Dodgers, as a private organization, benefiting from “eminent domain” land. He did not balk at the difficult task of the Dodgers assembling and purchasing their own land in that area and having the city assist with roads and infrastructure. That was all that O’Malley had ever asked for, nothing more or less, but not at vastly inflated prices for acquiring the many properties. While O’Malley held an open mind to alternate suggestions in Brooklyn, nothing feasible seemed to fall into place. 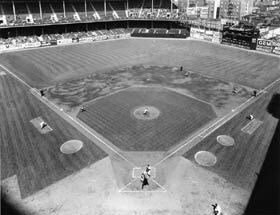 After much deliberation, Moses offered land in Flushing Meadows in the Borough of Queens late in the game in 1957. O’Malley, who had reviewed the possibility of a Queens site three years earlier and felt he was on a wild goose chase, made it clear that a site “five miles or 3,000 miles” outside of Brooklyn was irrelevant, because it still was not in Brooklyn. Other sites were mentioned including “one between a cemetery and Jamaica Bay” according to the Dodger President. O’Malley quickly retorted, “...we weren’t likely to get many customers from either place.”Time Magazine, “Walter In Wonderland,” April 28, 1958 Realizing that Moses had a much different view of the situation and his own political agenda, O’Malley decided to explore all of his options. Newly-built ballparks with greater seating capacity and more space for parking would attract additional fans. O’Malley only had to look at the success of the Milwaukee Braves, who had recently relocated from Boston, and were playing in a packed new stadium. 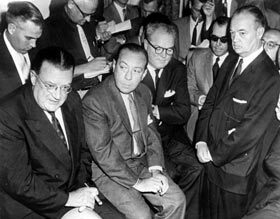 The Braves’ move in 1953 was the first realignment in the majors since 1903. The Braves, drawing twice as many fans as the Dodgers in their new ballpark (see chart), were making a greater profit than the Dodgers, who had been linked to Brooklyn since joining the National League in 1890. 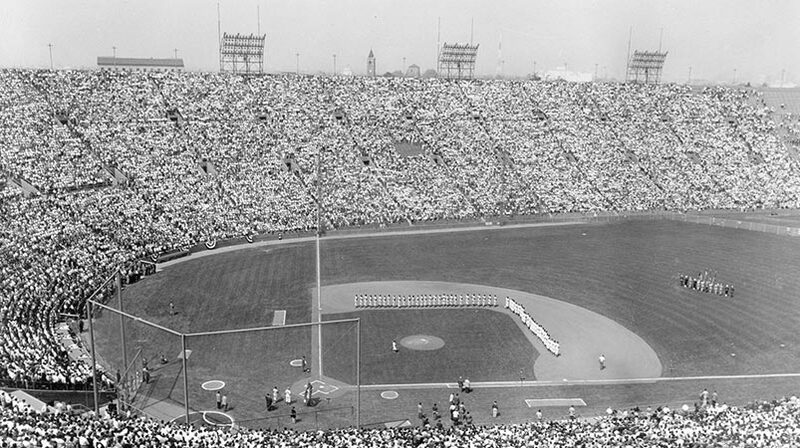 Despite attendance of one million a season and loyal fan support, the Dodgers played in a ballpark that was limited to 32,000 capacity. It would be the first of five airplanes the Dodgers would own during the innovative O’Malley regime, an investment that not only paid dividends and made him an efficiency expert, but established the Dodger organization as first class in every way. Ebbets Field provided a cozy atmosphere for Dodger fans in Brooklyn, but the stadium’s limited seating and parking capacities prompted Walter O’Malley’s quest for a new ballpark. 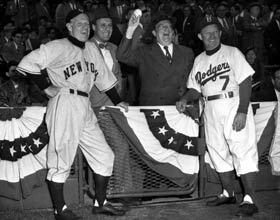 Opening Day at Ebbets Field in 1952 with (l-r) Giants Manager Leo Durocher, Dodger Vice President and General Manager Buzzie Bavasi, President Walter O’Malley and Manager Charlie Dressen. 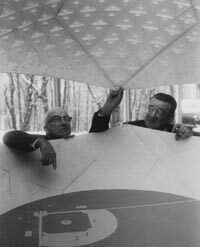 Walter O’Malley inspects a geodesic domed stadium model with architect R. Buckminster Fuller at Princeton University in November 1955.Photo by Wil Blanche. Copyright © 1955. All Rights Reserved. An artist’s rendition of the Club Level at the new Dodger Stadium. Patrons on this level also enjoyed the Stadium Club restaurant, which overlooked right field. 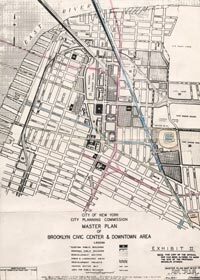 The City of New York’s Planning Commission outlined its Master Plan of the Brooklyn Civic and Downtown Area. Walter O’Malley engaged in a steady dialogue with the Commission in hopes of acquiring property for a privately financed ballpark. 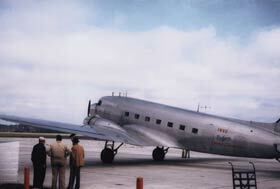 The Brooklyn Dodgers traveled in the early 1950s in their own plane, a Douglas DC-3.